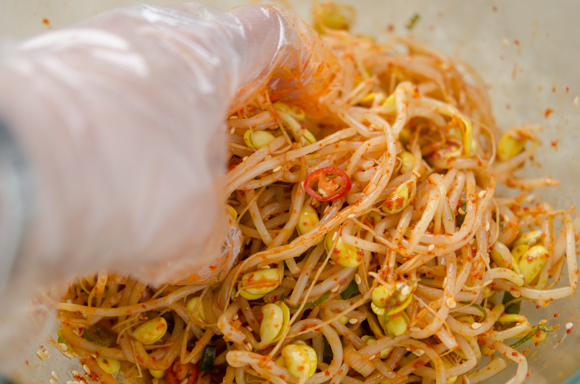 The most consumed vegetable next to the cabbage in Korea would be the bean sprouts. 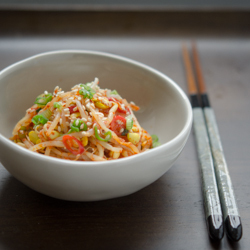 We often call it 국민반찬 (gookmin banchan), which translates into “The national side dish of People’s Republic of Korea”. Koreans eat bean sprouts A LOT. They are cheap, nutritious, and also very delicious to the taste. What’s there not to love about? 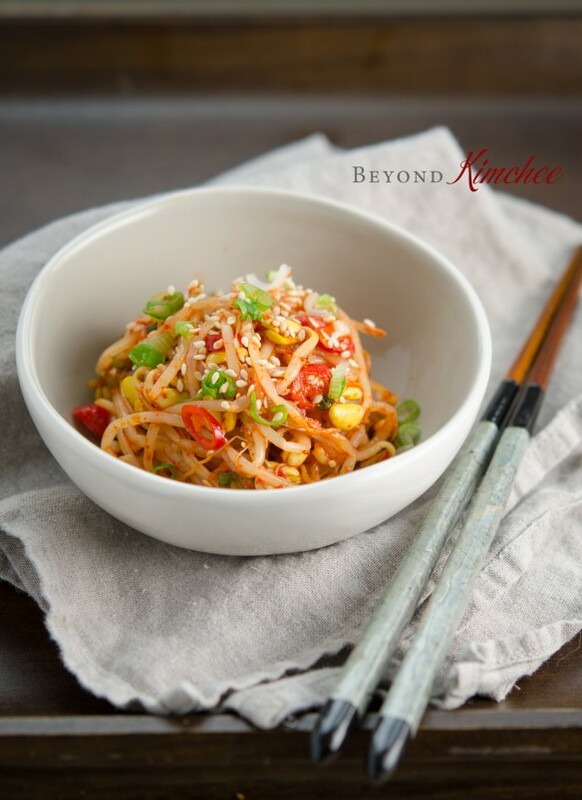 You can do many things with bean sprouts and here is a very simple Spicy Bean Sprout Salad that you always see in many Korean restaurants along with the plain bean sprout salad. Clean the sprouts in the water and remove all the yellowish shells off the heads. Place them in a large pot with 1/2 cup of water. COVER with a lid and bring to med-high heat and cook for 6 minutes (You will need to lower the heat to med-low after about 3 minutes). For some reason the “6 minutes” is the magical cooking time for bean sprouts to be crisp-tender. Just perfect! Important : DO NOT open the lid until your 6 minutes are up. Don’t even peek! Here is! soft yet still crunch! toss well first, then strain the sprouts to drain the liquid out. Place the sprouts in a mixing bowl and add all the seasonings: green onion, Korean chili flakes, Korean soy sauce for soup, garlic powder, sesame seeds, and a little salt. I added some fresh red chili since I always have some. You don’t need to. 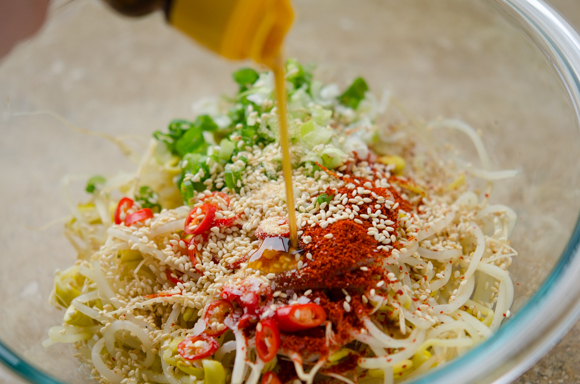 Drizzle the golden oil of Asia! 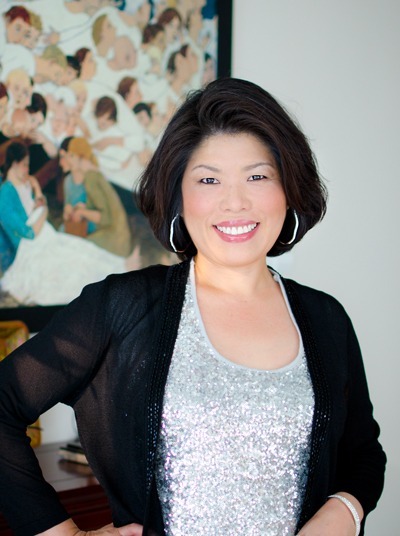 The sesame oil. Toss all together to incorporate the sprouts with the seasonings. The best tool for this job is your hand. Taste it, and season more with salt according to your taste. Very simple but so flavorful, I just have this strong urge to throw these sprouts and hot rice into a large serving bowl, drop a little gochujang (Korean chili paste), drizzle more sesame oil, and mix like crazy. Then shove a big spoonful of it into my mouth. That is soooo~ Korean thing to do! Hope you get to try it with these sprouts. Yum! extra salt to season, if needed. 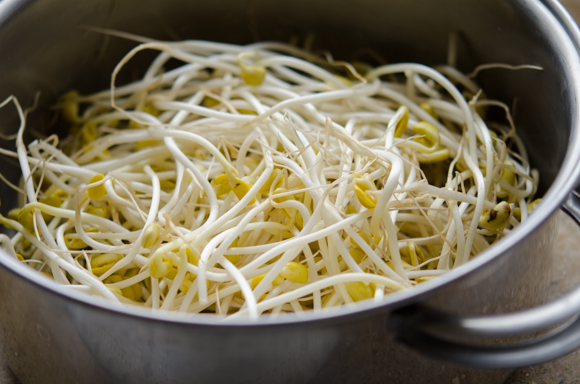 Put 1/2 cup water and 1/2 teaspoon salt in a large pot and spread bean sprouts over. Close with a lid and bring the pot over med-high heat and cook for 6 minutes (You will need to lower the heat a little after about 3 minutes). Do not open the lid during the cooking time. 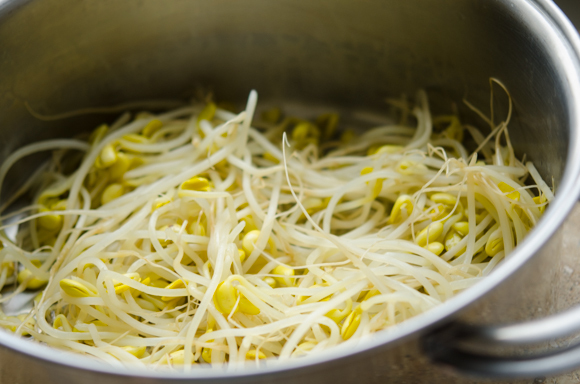 When done, toss the bean sprouts in the liquid first, then strain them out. Discard the liquid. 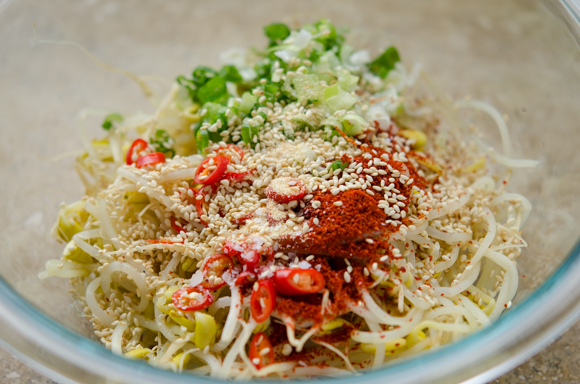 Place the sprouts in a large mixing bowl and add chili flakes, green onion, garlic powder, Korean say sauce for soup, sesame oil, and the sesame seeds, and fresh red chili (if using). Toss well to combine with your hand to incorporate the seasoning with the sprouts. Season with salt according to your taste. Hi Holly, do you squeeze the water out of the sprouts? I like your last paragraph, lol. I saw a lady on a Korean drama mixing some kind of vegetable in a bowl of rice with the sesame oil and pepper paste, stirred the whole thing like crazy and shoveling spoonfuls in her mouth. Hi Susan No need to squeeze water out of the sprouts. Just strain the water. Yes, many Koreans like to mix some vegetable side dishes all together with chili paste to make simple bibimbap. It is delicious that way. Nice, simple, tasty dish with a bit of zing. What's not to like? Really nice -- thanks. Beautiful - the color just pop out from the screen! 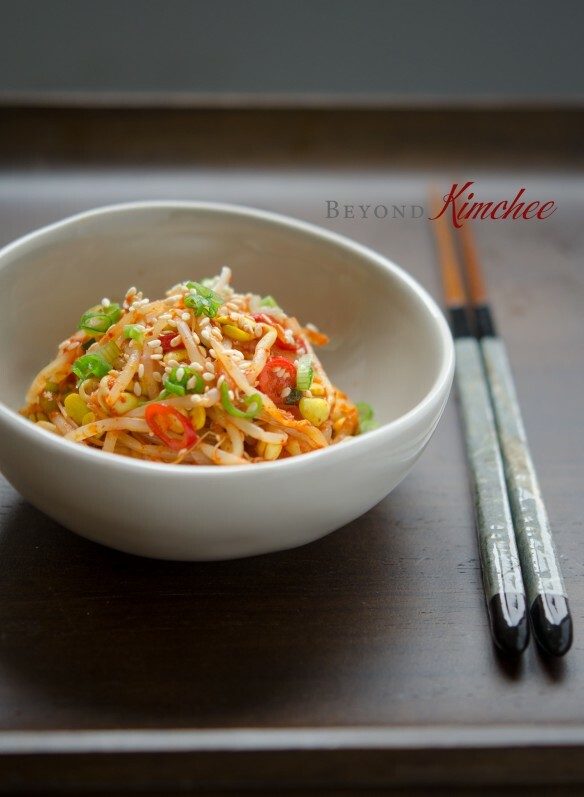 My husband loves Korean bean sprout salad, and this is perfect for BBQ season coming up. 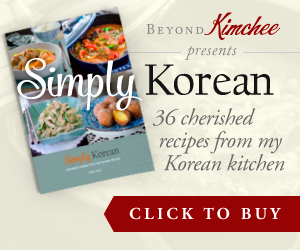 We love making Korean bbq short ribs at home! Would you believe that this banchan actually made me like beansprouts? I mean, I`ve always eaten, but never favored eating them in a bunch. But, whenever I ate at Korean restaurants, I would try this and fell in love with it! I love this beautiful salad. You had me at spicy. Can't wait to try it. Every time I've had beansprouts, they've been used as more of a garnish. I would love to try them as the main component of a salad. Yours looks really good! This is definitely a delicious veg salad, done it twice and my family love it so much! I have just had lunch but I would still eat a bowl of these. Looks very healthy.